Larry Bird retired from the Boston Celtics eighteen years ago today. Growing up outside of Boston, Bird was my childhood hero. Bird said to eat a McChicken; I ate a McChicken. Bird said to wear Converse sneakers; I wore Converse sneakers. It was that sort of thing. He left an indelible mark on my childhood and my life, teaching lessons of hard work, determination, and perseverance. The year Bird retired, I was living in the North End of Boston about two blocks from the Boston Garden. It was long known that Bird would be retiring at the end of the season, plagued by chronic back problems that cut his career short. I went to more than forty games that season, including more than half of their regular season games and all of the playoff games. I wanted to take in every moment I could of Bird’s career. I was there for Larry’s last great game, a double overtime victory over the Portland Trailblazers. Bird tied the game in regulation and scored 49 points. I remember him saying after the game, “You keep going to the well, the well runs dry.” Still makes me sad thinking about those words. A friend was waiting for me outside the arena for over an hour and a half for the game to get out. This was, of course, back before cell phones when you could just call someone. Suffice to say that there was no way that I was going to leave that game. While she was sitting on the curb waiting for me, someone passed by and dropped some change into her coffee cup. She must have looked that forlorn. I’m not sure she ever forgave me for that moment. I know I never forgot that game. All these years later, Bird is still with me in many ways. During the Celtics’ recent playoff run, I purchased a number of DVDs with games from Bird’s career. It’s been fun to re-watch some of those moments. It seems hard to believe that it was all those years ago. 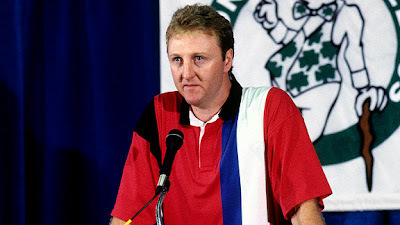 I remember many things from Bird’s press conference the day he retired. I can’t say I remembered just how ugly that shirt was he was wearing though. 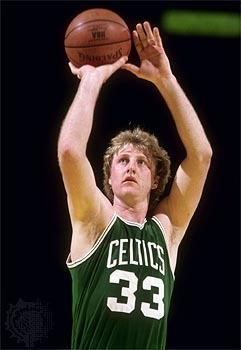 Anyway, here’s to Larry Bird. Thanks for all of the memories. Oh Sean, I cannot believe you brought up the double overtime versus the Blazers. For me, growing up in Willamette Valley, I am a Blazer fan. I watched that game as well…everyone did. Yes indeed, celebs, sports stars, and even writers can influence us and enchant us. Cityroute 16, it was indeed a magical time. No pun intended. Micah, ah the other side of the sports story! That was one heck of a game. I'm from IN and Larry was one of many, many great players. It was a fun place to grow up if you appreciate basketball. Hooray for Larry, Town Spa and the C'ridge! (and Giorgio's and La Familigia, for North End days). Anon, now THOSE are some good memories! Thanks for stopping by.